Alt text is the text that displays for an image before images are downloaded by the email client. Learn more about setting up alt text, styling it, and why it is important in this post. Why set up Alt text? Alt text is a shortened term for 'alternate text' and is the text that displays for an image before images are downloaded by the email client. In WordFy, using our Modern Editor email template builder, you can easily add alt text to any image. 2. On the right side of the email (the email preview panel), click on an image in your email. 3. In the section labeled 'alt' enter your alt text for the image. Alt text can be very helpful to subscribers receiving your email in a couple ways. Alt text helps inform users of the content of your email when images are not downloaded or when your images contain your call to action. Alt text is also used in web accessibility. Some of your subscribers might use screen readers to read your email. The alt text can serve to explain the image content. A new practice is to use styled alt text in your email. This is great because it gives you an opportunity to add some branding to your alt text instead of showing plain text before the image is downloaded. Let's review what you can do! Email client support for styled alt text varies from good to none, but we still wanted to provide the option to jazz up the alt text when images don’t load. 2. On the left side of the email (the edit content panel), click on the STYLESHEET tab. 3. Under ESSENTIALS click General Styles. 4. Click Image Alt Text right at the top. 5. Add your styles for your alt text. 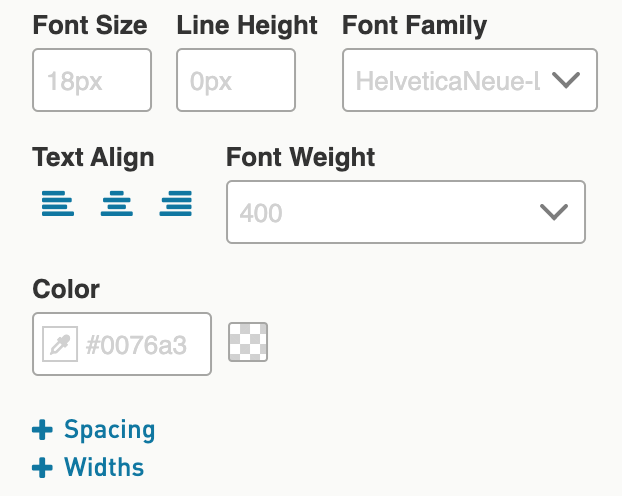 You can set the font family, font size, line height, text alignment, and text color for your alt text. 6. Click on the Blocks tab. 7. On the right side of the email (the email preview panel), click on an image in your email. 8. In the section labeled 'alt' enter your alt text for the image. 9. Save your email template. 10. In your Campaign send a test email to an email client that supports styled alt text to see how your styled alt text looks!